Cultivating Concepts: A few Thank you's, a few tears, some laughs, and a freebie I think! A few Thank you's, a few tears, some laughs, and a freebie I think! What a GREAT week. I think this font is only fitting it is called “Life is Good” (my favorite T-shirts too by the way) First I won that AH-MAZE-ING drawing at Teaching First Then I opened my comments and found I had been given an award by not one but TWO wonderful blogging friends Megan at First Grade Magic and Barbara at Corner onCharacter both sent me the Liebster Blog award for being a new blog. How nice is that?? If you don’t know their blogs you should go check them out they are FULL of great things. THENNNN I was scrolling through my old emails and I saw that I had got the SUNSHINE AWARD (and there I was feeling a little left out when I saw everyone else’s) I had forgotten all about that one with this crazy, busy last few weeks, Jennifer at Rowdy in First Grade sent that one my way and I feel HORRIBLE because I don’t even know if I remembered to say THANK YOU. So Thank You so very much to ALL three of you, you are so NICE, and my manners are so poor L. (geeze and I gripe about my kids). I promise I will do all the required work at the end of my post here but first on to other exciting things (and one sorta sad) about MY week…I kNOW you can hardly wait, right? This week was my sweet student teacher’s last week, which is always bittersweet because you are happy for them to be on their way, but sad to have them go. We celebrated by having a PAJAMA day and party. We also wore our jammies to celebrate collecting over THIRTY pair of children’s pajama’s to donate to the Scholastic Pajama drive. Have you heard of it? For every pair of pajamas you send to Scholastic they will donate a book to go with it. We did it last year, as well. The kids really enjoy it. This week also brought my first attempt at posting a worksheet to share. 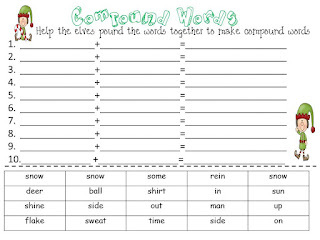 We are just learning about compound words and the kids are catching on AMAZINGLY ok, pretty well, so I created this little tip about pounding the words together to make one new word. Here is it for you, I hope it works. Click here to grab it. On a seasonal note I now have BOTH trees up and decorated MANY (fine) SOME presents bought. Tomorrow is my first Holiday party, a cookie exchange and lunch at my oldest dearest friend/cousins house. It should be a lot of FUN. I already have my ornament bought (Thank you Hadley) and will be making cookies in the morning (after I wake Hadley up to make them hee hee). 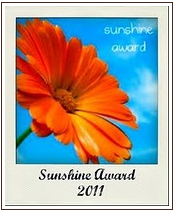 The Sunshine award says I need to answer these questions and then pass it on…hope I’m not too late. 3. I'm suppose to pass this on to 10 or so other blogs but it is going to take awhile to find some that haven't already received the award so I promise to look through my list and check it twice then I post my 10. 1. Favorite color? Is Camouflage a color? Not sure if it’s my Favorite but there sure is a LOT of it around my house…otherwise I’d say Barn red. 6. Your passion? My family, writing, and PARTIES and school/learning/teaching can I have that many? 3. Reveal your top five picks and let them know by leaving a comment on their blog. 4. Hope that your followers will spread the love to other bloggers!!! I have so many blogs that I LOVE and it is hard to narrow it down to just five. Have a Great Weekend! Only FIVE more days!!!! What a great week, Tammy. And it's almost time for vacation. Hope you have a very Merry Christmas.